We have set up functions for quick provisioning and easy printing of your picking lists. In the transaction Order-picking note print [INV06] you can combine any number of items into a picking note. Set the check mark at the desired positions. Press the Print button and select Picking list. You will receive a list of all selected items in PDF format for printing. Mark your desired orders with a tick and right-click on one order. Select Send from the context menu. 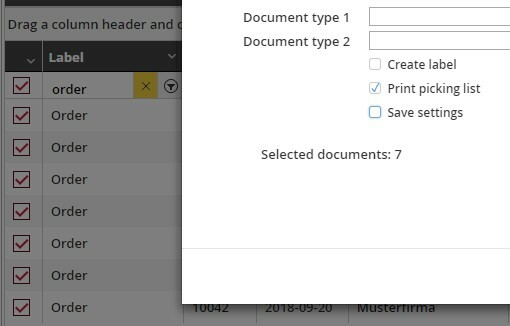 Activate Print Pick List in the pop-up and you will receive the list in PDF format for printing. ATTENTION: You can only create picking lists from orders!